ROADRUNNERS’ ladies captain Sam Whalley was abused and threatened as she ran through Whitley on Sunday morning after the cancellation of the Reading Half Marathon. Sam and her friend Nicky Chadwick were on the climb of Whitley Wood Lane when a car deliberately swerved towards them. Sam said: “We thought they had skidded but then they shouted ‘F… off you slags’, laughed hysterically and then drove manically almost 180 degrees on to the pavement. “Then, luckily, they seemed to notice my husband Ben and Jamie Cole were waiting for us nearby and drove back the way they came, in a crazy fashion. Mrs Whalley took the car’s registration number and reported the matter to the police. Her scare was the worst part of a bad day for our members which went downhill from the moment the big race was called off less than four hours before the scheduled start. Most people thought the decision could have been made the previous evening following the scrapping of the kids’ 3k event, the Green Park Challenge. 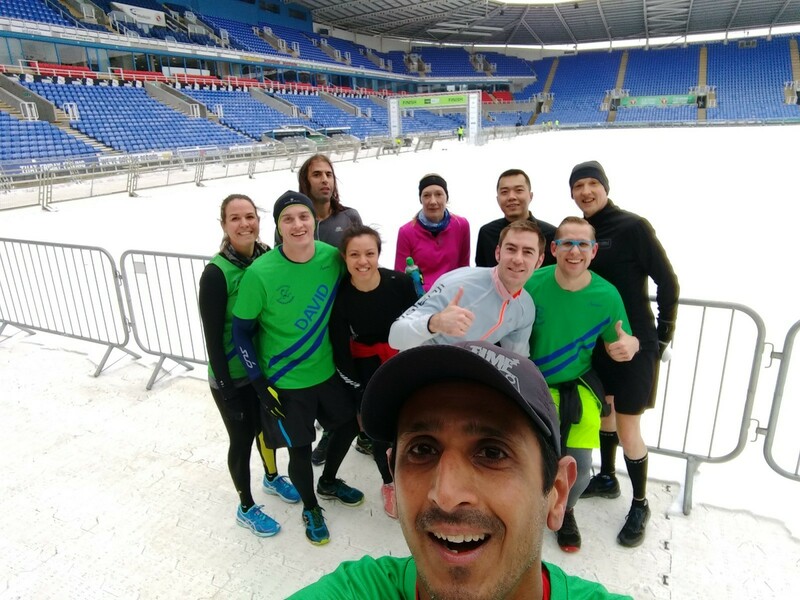 But in true Roadrunners’ spirit our members proved that the perfect antidote to the problem of having no Reading Half Marathon to run was……. to run the Reading Half Marathon anyway! I was one of several who decided to see for myself whether or not the course was fit for purpose. First to answer the question was triathlete Steve Ridley, who made an early start and ran the course before the scheduled time for the hooter. That didn’t stop Steve racing round in under 90 minutes! Back in the real world of those of us who can only dream of finishing in a time like that in perfect conditions, I joined near the seven-mile marker and ran ‘backwards’ against the normal flow. I soon got a cheer from Sylvia, the widow of the late Pete Darnell, ready to spectate and encourage from what I understand is her customary spot near the Abbey Gateway. Then I encountered a string of our quicker runners, starting with Chris and Gemma Buley, fitting the course into their 20-miler as part of their training for next month’s Brighton Marathon. Gemma’s verdict: “I would have been happy to have run the race but I could see why they cancelled it. Another Roadrunner training for a spring marathon, Brian Grieves, was also encountered pounding out the miles. I had been hoping that, as one of the official pacemakers, he would be helping me to beat the 1hr 40 marker, but it wouldn’t have happened in those conditions. Following Brian down Kendrick Hill was the Whalley group, enjoying their run before things were to turn sour for them later. Running through the University, I was surprised to see that the clearest roads of all were on the campus. The efforts there compared very favourably to the situation round the Madejski Stadium. It was extremely icy just outside the ground itself and the whole of the tented village area where runners congregate before the start was a sea of frozen ankle-deep slush. The finish area in the football ground was a depressing sight, being deserted apart from one groundsman preparing the pitch for next season’s campaign in League One. With a biting wind in my face all the way back to Caversham, I was disappointed to discover I had run only 16 miles rather than the 20 my marathon training programme stipulated. It was a day for the toughest and the best, as evidenced by a brief chat with Caroline Hoskins at the stadium later. “Did you manage to get a run this morning?” I asked. “19.6,” was the reply.